The RIAA in a report issued Thursday said U.S. retail revenue grew 11.4 percent to hit $7.7 billion, which in wholesale value equates to a growth of 9.3 percent to $5.3 billion. Helping drive the industry's biggest gain since 1998 was a doubling of paid subscription services, the report said. For the first time, 2016 saw streaming platforms like Apple Music, Spotify, Tidal and others account for a majority of American revenues at 51.4 percent. Free-to-listen internet radio products like Pandora and on-demand ad-supported services like YouTube and Vevo also contributed to the streaming pie. Streaming has grown from a bit player in the music industry — generating only 9 percent of revenues in 2011 — to the most important immediate and growth markets. As a whole, streaming brought in $3.9 billion in 2016, up 68 percent year-over-year. With products like Apple Music and Spotify leading the charge away from physical media purchases and traditional downloads, the latter being a distribution method pioneered by iTunes. 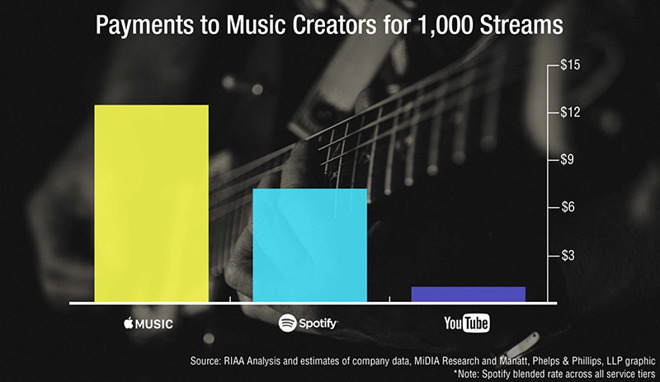 A majority of streaming listeners choose to consume music on free services like YouTube, which RIAA chairman & CEO Cary Sherman in a blog post said, "wrongly exploits legal loopholes to pay creators at rates well below the true value of music." Still, the paid subscription category experienced the highest levels of growth in 2016, with revenues from said services ending the year up 114 percent to $2.5 billion. The number of paid subscriptions also jumped to average 22.6 million for the year, up 109 percent from 10.8 million in 2015. For artists, paid subscription services appear to be the most beneficial in the longterm. Sherman says Apple Music pays out the highest royalties to music creators, followed by Spotify. Free and ad-supported platforms like YouTube trail far behind. Despite the recent upturn in streaming revenues, the recording industry is still suffering after failing to embrace the digital music revolution. In many ways, the RIAA has actively fought against digital, both in court and in the public arena. The industry seems loath to make the same mistake twice, however. "A year of growth in the U.S. music business is welcome news," Sherman writes. "It suggests that years of patiently nurturing a nascent streaming marketplace has begun to pay off. But it does not erase 15 years of declines, or continuing uncertainty about the future."